Text type: Writing is in raised black lettering, and is on the square plate, shaft and cross beam. Evidence of use in field (earth marking, cracking, staining, shrinkage): There is a large crack running up the centre of the shaft from about the bottom ¼ to the crossbeam, there is also what appears to be two nail holes about half way up. Finish (varnish, paint, oiled, unfinished etc): Looks to be treated in some way, not too sure what! 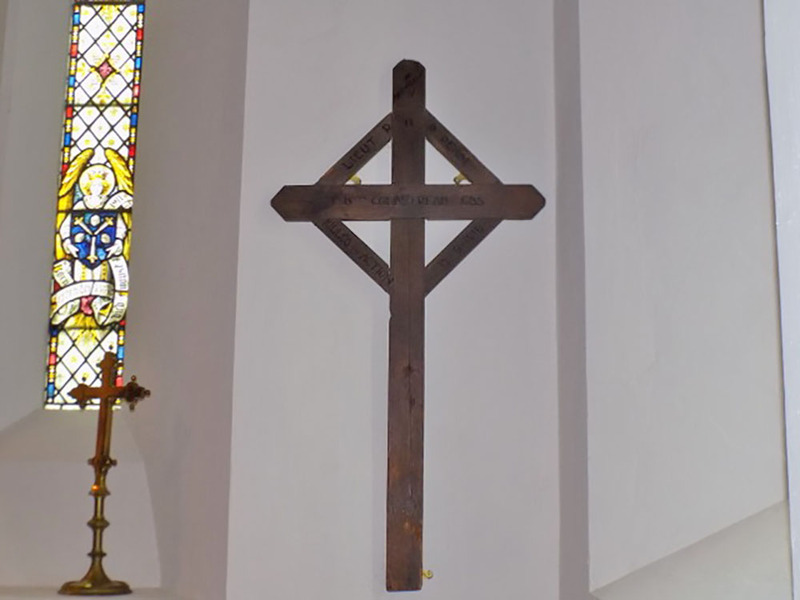 Condition (cracked, paint peeling, woodwork, damage etc): For the most part the cross is in good condition, apart from the above, the writing is still clearly legible and shows no sign of age. Lieutenant Ronald (Ronnie) Herbert Pike Pease, 1st Battalion Coldstream Guards, killed at Ginchy, 15th September 1916 aged 19. Educated at Eton he attained the rank of Serjeant in the OTC. His father was later to become the 1st Baron Daryngton, and Unionist MP for Darlington from 1898 to 1923. He applied for a commission in his final term at Eton and was accepted into the Coldstream Guards. He was posted to the first battalion, and crossed over to France on 9th May 1915. Two months later he left the battalion due to a weakness in his left knee which caused it to become infected, on 10th September he went before a Medical Board which found him fit for service. He was at Loos when the battalion attacked on the 28th September and was involved in the attack on the Hohenzollern Trenches on 17th October. Three spells of leave followed in December, February and May, during which time the Battalion was in the sectors at Neuve Chappelle, and then from February the Ypres Salient. On 30th July the battalion moved to The Somme and on the 26th August moved to the Bernafay Wood area in preparation for a major attack. 15th September 1916 will be remembered in history for the first use of tanks in battle, and while they enjoyed success around Flers Courcelette, further south the tanks that were to support The Coldstreamers attack from Ginchy towards Lesboeufs failed to arrive. Most of the officers became casualties straight away, including the C.O. and also Ronnie Pease, both of whom were killed. The Battalion went into the attack with 17 officers and 690 other ranks, and came out of it with 3 officers and 221 other ranks, the rest being killed, missing or wounded. The Germans, however, also had a very large number killed and wounded, and later a considerable number were taken prisoner. A letter sent by the Director of Graves Registration to Ronnie’s father on 3rd January 1917, stated that his son was buried about 300 yards east north east of Ginchy Church and that the grave was marked by a durable wooden cross with an inscription bearing full particulars. After the War his body was brought to the Guards’ Cemetery at Lesboeufs, the village which had been the objective of his Battalion on the day of his death and which was captured by the Guards Division ten days later.